Last week, I finally got to see up close the new start-up that longtime tech entrepreneur Andy Rebele has been working on quietly of late. And I do mean quiet — he’s now unveiling an effort to create a company called Pure Watercraft, which will make and sell electric boats. There are several such companies out there, in the wake of the many similar ones related to electric automobiles. But Rebele is doing it with his own money and sweat, to grow what will doubtless become an eventually large market. Rebele’s last outing was CityAuction, which he sold to IAC/InterActiveCorp for $54 million at the peak of the Web 1.0 action in 1999. He worked at Webvan, but has mostly been doing angel investing since. 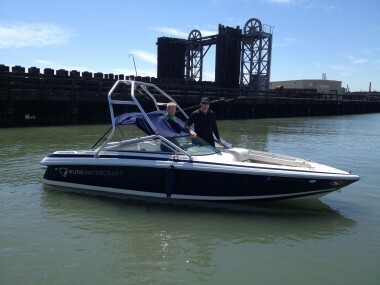 It’s an interesting effort, with issues of batteries, cooling and more, as you will see from the video interview I did during a ride on the San Francisco Bay last week.